We had our last gathering of 2010 this afternoon, looking at the theme of Advent. It’s both hard and amazing to think that we have now been gathering for around 18 months and have been using the crypt since April. Tonight we tried to enter into some of the mystery of the Advent season by thinking about the characters of the Christmas story, and tried to imagine what their expectations were of ‘the messiah’ or the child, or king, that they were going to see. We chatted about this quite a lot before we tried to earth this asking ourselves how we can prepare for Christ’s arrival in our lives, and what our expectations were of Christ being born afresh. I think someone shared a powerful image after visiting a family member who is expecting a baby soon. They are clearing a room out and decorating it in expectation fot he arrival of a new life. This has caused me to ask myself what, in my life, needs clearing out to allow the Christ child to be born afresh in my life. What else needs tidying up or decorating to be ready for this arrival? 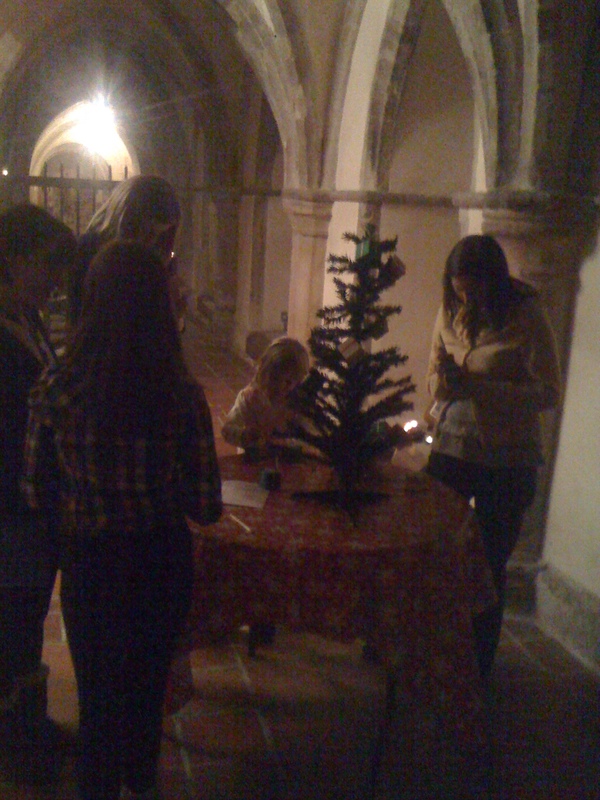 In our Open Space, our time for reflection and space to allow God to work, one of the stations was in the form of a Christmas tree. It was decorated with presents that contained our individual words of commitment. Each person took 2 presents – one to hang on the tree and one to take away as a reminder. Mine is now sitting on my desk with the word ‘time’ …. for me to prepare, I felt I needed to give God time to speak, to work and to change me. Different people wrote different things. It has been a good and interesting 18 or so months. Our next stage as a growing community is to get together to think about the way ahead … we want to be church in a different way, and I’m not sure whether people think we are doing that yet. We certainly have an interesting monthly gathering … but we want to be more than just an event and I wonder whether we are in danger of falling into tyhe trap of just putting on something, rather than living out something new. We meet in early January to talk so please hold the gathering in your prayers if you do such things! This entry was posted in gathering by robryan65. Bookmark the permalink.